A non-aggression pact or neutrality pact is a national treaty between two or more states/countries where the signatories promise not to engage in military action against each other. There was also a secret protocol to the pact, revealed only after Germany's defeat in 1945,  although hints about its provisions were leaked much earlier, e.g., to influence Lithuania. According to the protocol, Romania, Poland, Lithuania, Latvia, Estonia and Finland were divided into German and Soviet "spheres of influence". In the north, Finland, Estonia and Latvia were assigned to the Soviet sphere. Poland was to be partitioned in the event of its "political rearrangement": the areas east of the Pisa, Narev, Vistula and San rivers would go to the Soviet Union, while Germany would occupy the west. 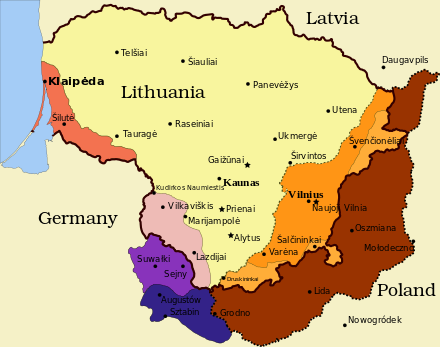 Lithuania, adjacent to East Prussia, would be in the German sphere of influence, although a second secret protocol agreed to in September 1939 reassigned the majority of Lithuania to the USSR. 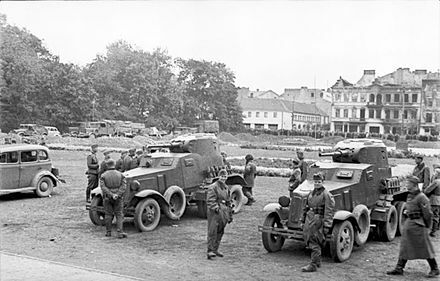 According to the protocol, Lithuania would be granted its historical capital Vilnius, which was under Polish control during the inter-war period. 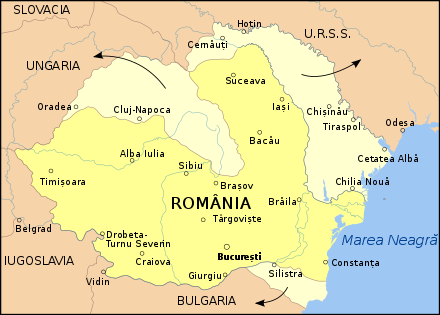 Another clause of the treaty stipulated that Germany would not interfere with the Soviet Union's actions towards Bessarabia, then part of Romania;  as a result, not only Bessarabia, but Northern Bukovina and Hertza regions too, were occupied by the Soviets, and integrated into the Soviet Union. Concerns over the possible existence of a secret protocol were first expressed by the intelligence organizations of the Baltic states[ citation needed ] scant days after the pact was signed. Speculation grew stronger when Soviet negotiators referred to its content during negotiations for military bases in those countries (see occupation of the Baltic States). 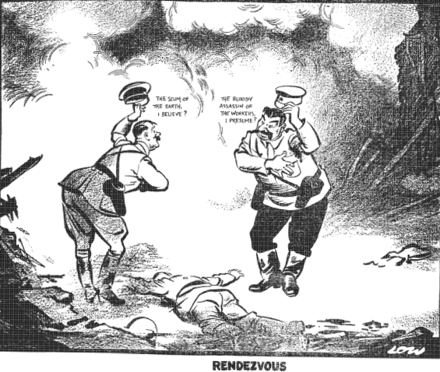 "Second Ribbentrop–Molotov Pact" of 28 September 1939. Map of Poland signed by Stalin and Ribbentrop (focused on the Kresy ) adjusting the German–Soviet border in the aftermath of German and Soviet invasion of Poland. Finally, on 26 June, four days after France had sued for an armistice with the Third Reich, the Soviet Union issued an ultimatum demanding Bessarabia and, unexpectedly, Northern Bukovina from Romania. 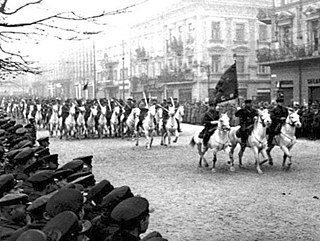 Two days later the Romanians acceded to the Soviet demands and the Soviets occupied the territories. The Hertza region was initially not requested by the USSR but was later occupied by force after the Romanians agreed to the initial Soviet demands. 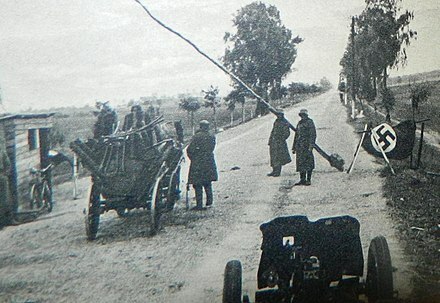 The subsequent waves of deportations began in Bessarabia and Northern Bukovina. When anti-German demonstrations erupted in Prague, Czechoslovakia, the Comintern ordered the Czech Communist Party to employ all of its strength to paralyze "chauvinist elements." Moscow soon forced the Communist Parties of France and Great Britain to adopt an anti-war position. 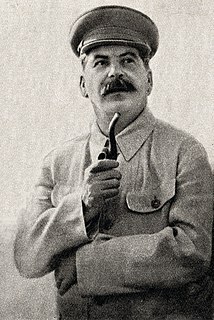 On 7 September, Stalin called Georgi Dimitrov,[ clarification needed ] and the latter sketched a new Comintern line on the war. The new line—which stated that the war was unjust and imperialist—was approved by the secretariat of the Communist International on 9 September. Thus, the various western Communist parties now had to oppose the war, and to vote against war credits. Although the French Communists had unanimously voted in Parliament for war credits on 2 September and on 19 September declared their "unshakeable will" to defend the country, on 27 September the Comintern formally instructed the party to condemn the war as imperialist. 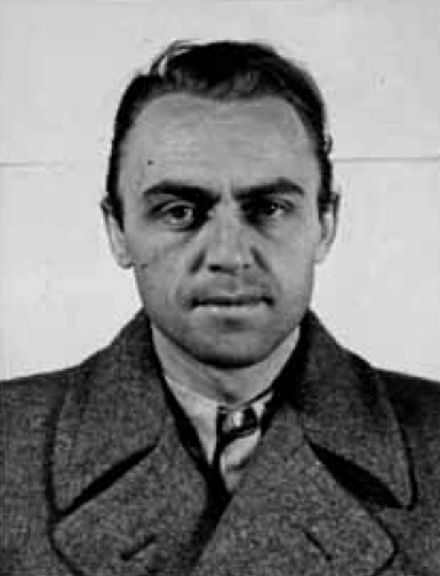 By 1 October the French Communists advocated listening to German peace proposals, and Communist leader Maurice Thorez deserted from the French Army on 4 October and fled to Russia. Other Communists also deserted from the army. In the United States, "The leftists, of course, included the Communist Party, which during the 1939–1941 era of the Nazi-Soviet pact, was slavish in its effort to appease Hitler and sabotage the Allied cause and American preparedness. Their soul mate in Congress was Vito Marcantonio of New York's American Labor Party." Despite opposition from left and right, American aid continued to make a short war unlikely. 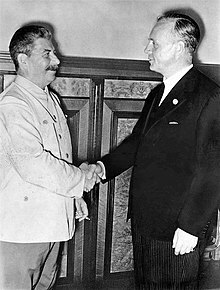 ↑ The pact was also known as the Nazi–Soviet Pact,  the Hitler–Stalin Pact,  or the German–Soviet Nonaggression Pact   (by Time as Communazi Deal  or Communazi Pact  ). 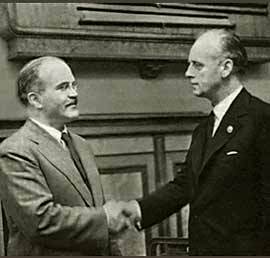 The timeline of the Molotov–Ribbentrop Pact is a chronology of events, including Molotov–Ribbentrop Pact negotiations, leading up to, culminating in, and resulting from the Molotov–Ribbentrop Pact. The Treaty of Non-aggression between Nazi Germany and the Soviet Union was signed in the early hours of August 24, 1939, but was dated August 23. 1 2 Charles Peters (2005), Five Days in Philadelphia: The Amazing "We Want Willkie!" Convention of 1940 and How It Freed FDR to Save the Western World, New York: PublicAffairs, Ch. 12, "The Deal and the Muster", p. 164, ISBN 978-1-58648-112-4. ↑ "The Hitler-Stalin Pact". History.com. 2009-11-16. Retrieved 2018-12-15. ↑ History.com (2016), German-Soviet Nonaggression Pact. World War II series. 1 2 "Arms & Art". Time. September 11, 1939. .
1 2 "Children of Moscow". Time. September 18, 1939. .
↑ "100(0) Schlüsseldokumente" (facsimile). DE . Retrieved 17 September 2009. ↑ Zabecki, David (2014). 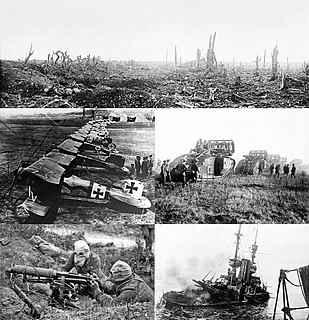 Germany at war : 400 years of military history. Santa Barbara, California: ABC-CLIO, LLC. p. 536. ISBN 1-59884-981-6. ↑ Senn, Alfred (January 1990). "Perestroika in Lithuanian Historiography: The Molotov-Ribbentrop Pact". The Russian Review. 49 (1): 44-53. doi:10.2307/130082. 1 2 "Russian historians defend the Molotov-Ribbentrop Pact". ↑ Parfitt, Tom (6 November 2014). "Vladimir Putin says there was nothing wrong with Soviet Union's pact with Adolf Hitler's Nazi Germany". Daily Telegraph . Retrieved 20 May 2015. ↑ 'During a visit to Poland in 2009, Putin, then prime minister, denounced the Molotov-Ribbentrop Pact as a "collusion to solve one's problems at others' expense."' Anna Dolgov 2015, Putin Defends Ribbentrop-Molotov Pact in Press Conference with Merkel. Moscow Times. ↑ "Peace Treaty of Brest-Litovsk". BYU. 3 March 1918. .
↑ "German–Russian agreement". Rapallo: Mt Holyoke. 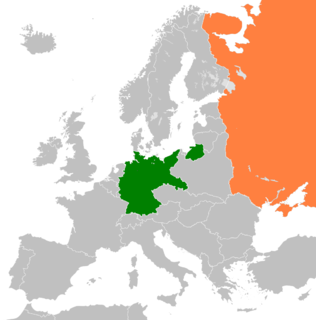 16 April 1922. .
↑ "Treaty of Berlin Between the Soviet Union and Germany". Yale. 24 April 1926. .
1 2 Ericson 1999, pp. 14–5. ↑ Lee, Stephen J; Paul, Shuter (1996). Weimar and Nazi Germany. Heinemann. p. 33. ISBN 0-435-30920-X. .
↑ Müller, Rolf-Dieter; Ueberschär, Gerd R (2002). Hitler's War in the East, 1941–1945: A Critical Assessment. Berghahn. p. 244. ISBN 978-1-57181-293-3. .
↑ Rauschning, Hermann (2006). Hitler Speaks: A Series of Political Conversations With Adolf Hitler on His Real Aims. Kessinger. pp. 136–7. ISBN 978-1-4286-0034-8. .
↑ Ericson, Edward E III (May 1998). "Karl Schnurre and the Evolution of Nazi–Soviet Relations, 1936–1941". German Studies Review. 21 (2): 263–83. doi:10.2307/1432205. JSTOR 1432205. .
1 2 Jurado, Carlos Caballero; Bujeiro, Ramiro (2006). The Condor Legion: German Troops in the Spanish Civil War. Osprey. pp. 5–6. ISBN 1-84176-899-5. .
↑ Lind, Michael (2002). Vietnam, the Necessary War: A Reinterpretation of America's Most Disastrous Military Conflict. Simon & Schuster. p. 59. ISBN 978-0-684-87027-4. .
↑ Gerhard, Weinberg (1970). 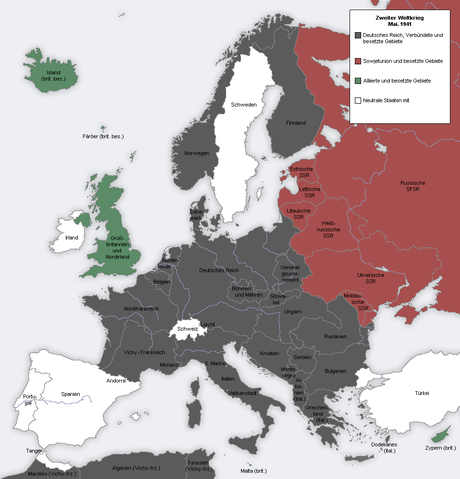 The Foreign Policy of Hitler's Germany Diplomatic Revolution in Europe 1933–36. Chicago: University of Chicago Press. p. 346. .
↑ Spector, Robert Melvin. World Without Civilization: Mass Murder and the Holocaust, History, and Analysis. p. 257. .
↑ Roger,, Moorhouse,. The devils' alliance : Hitler's pact with Stalin, 1939-41. London. ISBN 9780099571896. OCLC 934937192. ↑ "Hitler and Russia". The Times. London. 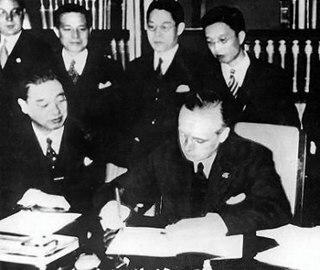 June 24, 1941. .
↑ "Agreement concluded at between Germany, Great Britain, France and Italy". Munich: Yale. 29 September 1938. [ permanent dead link ]. ↑ Beloff, Max (Oct 1950). "Soviet Foreign Policy, 1929–41: Some Notes". Soviet Studies. 2 (2): 123–37. doi:10.1080/09668135008409773. .
1 2 Ericson 1999, pp. 1–2. ↑ Collier, Martin; Pedley, Philip. Germany, 1919–45. .
↑ Kinder, Hermann; Hilgemann, Werner (1978). The Anchor Atlas of World History. II. New York: Anchor Press, Doubleday. p. 165. ISBN 0-385-13355-3. .
↑ Crozier, Andrew J. The Causes of the Second World War. p. 151. .
↑ Brown, Robert J (2004-01-01). Manipulating the Ether: The Power of Broadcast Radio in Thirties America. ISBN 0-7864-2066-9. .
1 2 3 4 Watson 2000, pp. 696–8. 1 2 3 4 Roberts 2006, p. 30. ↑ "Tentative Efforts To Improve German–Soviet Relations, April 17 – August 14, 1939". Yale. .
1 2 Grogin, Robert C (2001). Natural Enemies: The United States and the Soviet Union in the Cold War, 1917–1991. Lexington. p. 28. .
1 2 Watson 2000, p. 695. ↑ Roberts, G (December 1997). "The Journal of Modern History" (review of Raack, R, Stalin's Drive to the West, 1938–1945: The Origins of the Cold War). 69 (4): 787. .
1 2 Watson 2000, p. 696. 1 2 Shirer 1990, p. 502. ↑ Hiden, John (2003). The Baltic and the Outbreak of the Second World War. Cambridge University Press. p. 46. ISBN 0-521-53120-9. .
↑ Gromyko, Andrei; Ponomarev, B. N. Ponomarev (1981). Soviet foreign policy : 1917-1980 Collectible Soviet foreign policy : 1917-1980. Progressive Publishers. p. 89. .
↑ Butler, Susan (2016). 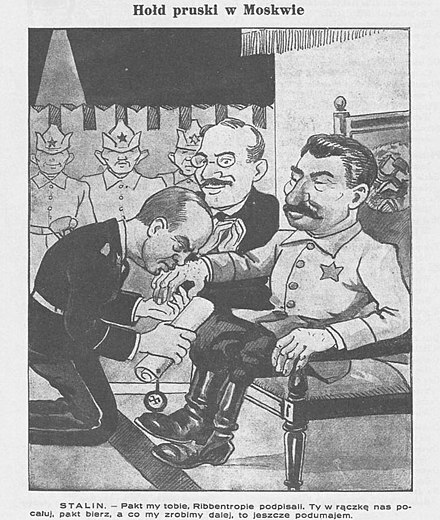 Roosevelt and Stalin: Portrait of a Partnership. Vintage Books. p. 173. .
↑ Gerhard L. Weinberg (2010). Hitler's Foreign Policy 1933-1939: The Road to World War II. p. 749. 1 2 Nekrich, Ulam & Freeze 1997, pp. 109–10. ↑ Bertriko, Jean-Jacques; Subrenat, A; Cousins, David (2004). Estonia: Identity and Independence. Rodopi. p. 131. ISBN 90-420-0890-3. .
↑ Cienciala, Anna M (2006) . "The Coming of the War and Eastern Europe in World War II" (lecture notes). University of Kansas. .
↑ Murphy, David E (2006). What Stalin Knew: The Enigma of Barbarossa. Yale University Press. p. 23. ISBN 0-300-11981-X. .
↑ Tolischus, Otto D. (25 August 1939). "Nazi Talks Secret: Hitler Lays Plans with His Close Aides for the Partition of Poland". New York Times. p. 1. Retrieved 2 January 2019. ↑ Byas, Hugh (26 August 1939). "Japanese Protest Hitler-Stalin Pact". New York Times. p. 1. Retrieved 2 January 2019. ↑ "Paris Communists Stunned by Accord". New York Times. 26 August 1939. p. 2. Retrieved 2 January 2019. ↑ Tolischus, Otto D. (26 August 1939). "Berlin Talks Held: Nazi Quarters Now Feel General European war Has Been Averted". New York Times. p. 1. Retrieved 2 January 2019. ↑ "Polish Made Easy for Reich Troops: Booklet on Sale Has Phonetic Aid—'Good Day, Mr. Mayor' Is the Opening Phrase: GLEIWITZ FEARS RAIDS". New York Times. 28 August 1939. p. 2. Retrieved 2 January 2019. ↑ "Soviet Fails to Act on Pact With Reich". New York Times. 28 August 1939. p. 1. Retrieved 2 January 2019. ↑ "See Secret in Accord: Dr. Harper Says Stalin-Hitler Pact May Prove an Alliance". New York Times. 28 August 1939. p. 11. Retrieved 2 January 2019. ↑ "Russian Massing Soldiers in West". New York Times. 30 August 1939. p. 1. Retrieved 2 January 2019. 1 2 3 4 5 "Text of the Nazi–Soviet Non-Aggression Pact". Fordham. 23 August 1939. .
↑ Christie, Kenneth (2002). Historical Injustice and Democratic Transition in Eastern Asia and Northern Europe: Ghosts at the Table of Democracy. RoutledgeCurzon. ISBN 0-7007-1599-1. .
↑ van Dijk, Ruud, ed. (2008). Encyclopedia of the Cold War. London. p. 597. ISBN 978-0-415-97515-5. .
↑ Wegner, Bernd, ed. (1997). From Peace to War: Germany, Soviet Russia and the World, 1939–1941. Providence and Oxford: Berghahn. p. 507. ISBN 978-1-57181-882-9. .
↑ Dębski, Sławomir (2007). Między Berlinem a Moskwą. Stosunki niemiecko-sowieckie 1939–1941. Warszawa: Polski Instytut Spraw Międzynarodowych. ISBN 978-83-89607-08-9. .
↑ Dunn, Dennis J (1998). Caught Between Roosevelt & Stalin: America's Ambassadors to Moscow. University Press of Kentucky. pp. 124–5. ISBN 0-8131-2023-3. .
↑ "Moscow's Week". Time. October 9, 1939. .
↑ "Revival". Time. October 9, 1939. .
↑ "Communazi Columnists". Time. June 3, 1940. .
↑ Chambers, Whittaker (January 6, 1941). "The Revolt of the Intellectuals". Time. ↑ "In Again, Out Again". Time. April 7, 1941. .
↑ Sheen, Fulton John (1948). Communism and the Conscience of the West. Bobbs–Merrill. p. 115. .
↑ "The Soviet Union and the Eastern Front". encyclopedia.ushmm.org. Retrieved 2019-01-26. 1 2 Shirer 1990, pp. 541–2. 1 2 3 Nekrich, Ulam & Freeze 1997, p. 123. ↑ McDonough, Frank. Neville Chamberlain, Appeasement and the British Road to War. p. 86. .
↑ Black, Jeremy (2012). Avoiding Armageddon: From the Great War to the Fall of France, 1918–40. A&C Black. p. 251. ISBN 978-1-4411-5713-3. ↑ Garvin, JL. "German Atrocities in Poland". Free Europe: 15. .
↑ "Um Swiecie". PL. Archived from the original on 2009-03-31. .
↑ Gilbert, Martin (1990). The Holocaust. Fontana. pp. 85–88. ISBN 0-00-637194-9. .
↑ The German New Order in Poland: Part One. Felsztyn. Tripod. .
↑ "Seven Years War?". Time . October 2, 1939. .
↑ Zaloga, Steven J (2002). Poland 1939. Botley, UK: Osprey. p. 80. .
1 2 Nekrich, Ulam & Freeze 1997, p. 131. ↑ Sudoł, Adam, ed. (1998). Sowietyzacja Kresów Wschodnich II Rzeczypospolitej po 17 września 1939 (in Polish). Bydgoszcz: Wyższa Szkoła Pedagogiczna. p. 441. ISBN 83-7096-281-5. 1 2 Weiner, Myron; Russell, Sharon Stanton, eds. (2001). "Stalinist Forced Relocation Policies". Demography and National Security. Berghahn Books. pp. 308–15. ISBN 1-57181-339-X. ↑ Kozłowski, Bartłomiej (2005). ""Wybory" do Zgromadzeń Ludowych Zachodniej Ukrainy i Zachodniej Białorusi". Polska (in Polish). PL: NASK. Archived from the original on 28 June 2006. Retrieved 13 March 2006. ↑ Gross, Jan Tomasz (2003). Revolution from Abroad. Princeton: Princeton University Press. p. 396. ISBN 0-691-09603-1. .
↑ "German–Soviet Boundary and Friendship Treaty". Yale. .
1 2 3 4 5 Wettig, Gerhard (2008). Stalin and the Cold War in Europe. Landham, MD, US: Rowman & Littlefield. pp. 20–21. ISBN 0-7425-5542-9. 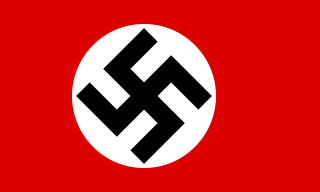 ↑ "Declaration of the Government of the German Reich and the Government of the USSR of September 28, 1939". Yale. Archived from the original on November 26, 2005. .
↑ Domas, Krivickas (Summer 1989). "The Molotov–Ribbentrop Pact of 1939: Legal and Political Consequences". Lituanus. 34 (2). ISSN 0024-5089. .
1 2 Kennedy-Pipe, Caroline (1995). Stalin's Cold War. New York: Manchester University Press. ISBN 0-7190-4201-1. .
↑ Mosier, John (2004). The Blitzkrieg Myth: How Hitler and the Allies Misread the Strategic Realities of World War II. HarperCollins. p. 88. ISBN 0-06-000977-2. .
↑ "Obozy jenieckie żołnierzy polskich" [Prison camps for Polish soldiers] (in Polish). PL: Internetowa encyklopedia PWN. Archived from the original on 2013-11-04. Retrieved 28 November 2006. .
↑ "Edukacja Humanistyczna w wojsku". Dom wydawniczy Wojska Polskiego [Official publication of the Polish Army](PDF) (in Polish). PL. 2005. ISSN 1734-6584. Archived from the original (PDF) on 2008-03-07. .
↑ "Молотов на V сессии Верховного Совета 31 октября цифра "примерно 250 тыс."" (in Russian). 1 2 Fischer, Benjamin B (Winter 1999–2000). "The Katyn Controversy: Stalin's Killing Field". Studies in Intelligence . US: CIA. .
↑ Sanford, George (2005). Katyn and the Soviet Massacre of 1940: Truth, Justice and Memory (Google Books). BASEES – Russian and East European studies: British Association for Soviet, Slavonic and East European Studies. 20. Routledge. pp. 20–24. ISBN 978-0-415-33873-8. .
↑ "Stalin's Killing Field" (PDF). CIA. Retrieved 2008-07-19. ↑ "Excerpt from the minutes No. 13 of the Politburo of the Central Committee meeting, shooting order" (in Russian and English). CA: Electronic museum. March 5, 1940. Archived from the original on 5 May 2008. Retrieved 19 December 2005. .
↑ Senn, Alfred Erich (2007). Lithuania 1940: Revolution from Above. Amsterdam, New York: Rodopi. ISBN 978-90-420-2225-6. .
1 2 Roberts 2006, p. 55. ↑ Pogonowski, Iwo (1998). Jews in Poland. Hippocrene. p. 101. ISBN 0-7818-0604-6. .
1 2 3 Garlinski 1987, p. 28. 1 2 3 4 5 "USHMM". .
↑ Wardzyńska, Maria (2009). Był rok 1939 Operacja niemieckiej policji bezpieczeństwa w Polsce. Intelligenzaktion (in Polish). IPN Instytut Pamięci Narodowej. ISBN 978-83-7629-063-8. .
↑ Meier, Anna. Die Intelligenzaktion: Die Vernichtung Der Polnischen Oberschicht Im Gau Danzig-Westpreusen. VDM Verlag Dr. Müller. ISBN 978-3-639-04721-9. .
↑ Zamoyski, Adam (1989). The Polish Way. John Murray. p. 358. ISBN 0-7195-4674-5. .
1 2 3 "Nazi German Camps on Polish Soil During World War II". PL: MSZ. .
↑ Berenbaum, Michael (2006). "The World Must Know". United States Holocaust Memorial Museum: 114. .
↑ "Deportations to and from the Warsaw Ghetto". US: Holocaust Memorial Museum. .
↑ Harmon, Brian; Drobnicki, John. "Historical sources and the Auschwitz death toll estimates". Techniques of denial. The Nizkor Project. External link in |publisher= (help). ↑ Piper, Franciszek; Meyer, Fritjof (2002). "Die Zahl der Opfer von Auschwitz. Neue Erkentnisse durch neue Archivfunde". Osteuropa (review article) (in German). PL: Auschwitz. 52, Jg (5): 631–41. Archived from the original on 2011-05-21. .
↑ Vladimir Beshanov (2008). Czerwony Blitzkrieg (in Polish). PL: Inicjał. pp. 250–62. ISBN 978-83-926205-2-5. .
1 2 Wasserstein, Bernard (2007). Barbarism and Civilization: A History of Europe in Our Time. Oxford University Press. p. 305. ISBN 0-19-873074-8. .
↑ "Represje 1939–41 Aresztowani na Kresach Wschodnich" [Repressions 1939–41. Arrested on the Eastern Borderlands] (in Polish). PL: Ośrodek Karta. Archived from the original on 10 December 2006. Retrieved 15 November 2006. .
↑ "Okupacja Sowiecka w Polsce 1939–41". Internetowa encyklopedia PWN (in Polish). Retrieved March 14, 2006. .
↑ Wierzbicki, Marek; Płużański, Tadeusz M (March 2001). "Wybiórcze traktowanie źródeł". Tygodnik Solidarność (March 2, 2001). ↑ Głowacki, Albin (September 2003). Chmielowiec, Piotr, ed. Formy, skala i konsekwencje sowieckich represji wobec Polaków w latach 1939–1941. Okupacja sowiecka ziem polskich 1939–1941 (in Polish). Rzeszów-Warsaw: Instytut Pamięci Narodowej. ISBN 83-89078-78-3. Archived from the original on 2003-10-03. ↑ Rummel, RJ (1990). Lethal Politics: Soviet Genocide and Mass Murder Since 1917. p. 132. ISBN 978-1-4128-2750-8. .
↑ Kushner, Tony; Knox, Katharine (1999). Refugees in an Age of Genocide. p. 219. ISBN 978-0-7146-4783-8. .
↑ Davies, Norman (1982). God's Playground. A History of Poland. 2: 1795 to the Present. Oxford: Oxford University Press. pp. 449–55. ISBN 0-19-925340-4. ↑ Wegner, Bernd (1997). From Peace to War: Germany, Soviet Russia, and the World, 1939–1941 (Google books). Berghahn Books. p. 78. ISBN 1-57181-882-0. .
1 2 3 Ericson 1999, pp. 150–3. 1 2 3 Johari, JC (2000). Soviet Diplomacy 1925–41. 1925–27. Anmol. pp. 134–7. ISBN 81-7488-491-2. .
1 2 Gunther, John (1940). Inside Europe. New York: Harper & Brothers. pp. 137–138. 1 2 Friedrich, Otto (1997). City of Nets: A Portrait of Hollywood in the 1940s (reprint ed.). Berkeley; Los Angeles: University of California Press. p. 24. ISBN 0-520-20949-4. 1 2 3 4 Cohen, Yohanon (1989). Small Nations in Times of Crisis and Confrontation. SUNY Press. p. 110. ISBN 0-7914-0018-2. .
↑ "From the Red Flag to the Union Jack". What next journal. UK. .
1 2 Jackson, Julian (2001). France: The Dark Years, 1940–1944. Oxford University Press. pp. 18, 114–15. ISBN 0-19-820706-9. ↑ "Som von Außen", Sozmit, DE: FES . ↑ "Sozialistische Mitteilungen" (8). DE: FES. 1940. .
↑ Hofer, Walther (2007). Die Entfesselung des Zweiten Weltkrieges. Lit. pp. 224–5. ISBN 978-3-8258-0383-4. Die Welt, February 1940. ↑ Pietrow-Ennker, Bianka (2000). 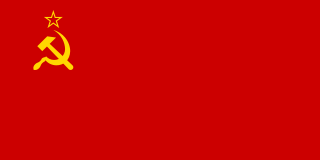 "Stalinistische Außen- und Deutschlandpolitik 1939–1941". In Pietrow-Ennker, Bianka. Präventivkrieg? Der deutsche Angriff auf die Sowjetunion (3 ed.). Frankfurt am Main: Fischer. p. 85. ISBN 978-3-596-14497-6. 1 2 3 4 5 Shirer 1990, pp. 668–9. ↑ Kennan, George (1961). Russian and the West, under Lenin and Stalin. NY: Mentor. pp. 318–9. .
↑ Cartier, Raymond (1962). Hitler et ses Généreaux[Hitler and his Generals] (in French). Paris: J'ai Lu/A. Faiard. p. 233. .
↑ Sontag, RJ; Beddie, JS, eds. (1948). Nazi–Soviet Relations 1939–1941. Washington, DC: State Department. p. 151. .
1 2 Philbin 1994, pp. 48, 59. 1 2 Shirer 1990, p. 720. 1 2 Roberts 2006, p. 59. 1 2 Roberts 2006, p. 66. ↑ Weeks, Albert L (2003). Stalin's Other War: Soviet Grand Strategy, 1939–1941. Rowman & Littlefield. pp. 74–5. ISBN 0-7425-2192-3. .
↑ Ferguson, Niall (2005-06-12). "Stalin's Intelligence". Review of books by Murphy, Pleshakov, and Service. The New York Times . Retrieved 2010-03-27. 1 2 Dreifeilds, Juris (1996). Latvia in Transition. Cambridge University Press. pp. 34–5. ISBN 0-521-55537-X. .
↑ "Record Group 84, POLAD, Classified General Correspondence, 1945–49". National Archives and Record Administration. Box 100. [Archive] Location 350/57/18/02. .
↑ "Modern views on the Nazi–Soviet pact". News. BBC. 2009-08-26. Retrieved 2010-03-27. ↑ "Remembrance and Solidarity. Studies in 20th Century European History" (PDF). Issue 1, Number 1. European Network Remembrance and Solidarity. December 2012. p. 18. Archived from the original (PDF file, direct download) on 2013-09-29. Retrieved 24 August 2014. ↑ Taubert, Fritz (2003). The Myth of Munich. Oldenbourg Wissenschaftsverlag. p. 318. ISBN 3-486-56673-3. .
↑ Henig, Ruth Beatrice (2005). The Origins of the Second World War, 1933–41. Routledge. pp. 67–68. ISBN 0-415-33262-1. .
↑ Ведомости Съезда народных депутатов СССР и Верховного Совета СССР (text of the declaration) (in Russian) (29). RU: Law mix. 1989. Ст. 579. .
↑ Borejsza, Jerzy W; Ziemer, Klaus; Hułas, Magdalena (2006). Totalitarian and Authoritarian Regimes in Europe. Berghahn. p. 521. .
↑ Loeber, Dietrich A. "Consequences of The Molotov–Ribbentrop Pact for Lithuania of Today International Law Aspects" (PDF). LFPR. Archived from the original (PDF) on 2009-05-30. Retrieved 2009-11-07. 1 2 Борис, Хавкин (Boris Xavkin) (2007). "К истории публикации советских текстов советско-германских секретных документов 1939—1941 гг." Форум новейшей восточноевропейской истории и культуры — Русское издание (in Russian) (1). DE: KU Eichstaett. .
↑ "Putin condemns Nazi–Soviet pact". BBC News. 31 August 2009. Retrieved 31 August 2009. ↑ Tom Parfitt (2014-11-06). "Vladimir Putin says there was nothing wrong with Soviet Union's pact with Adolf Hitler's Nazi Germany". Telegraph. Retrieved 2014-11-06. "The Russian president made the comments at a meeting with young historians in Moscow, during which he urged them to examine the lead-up to the war, among other subjects." - how does Parfitt know that ? Which young historicans ? Where in Moscow ? ↑ Nick Holdsworth in Moscow (18 October 2008). "Stalin 'planned to send a million troops to stop Hitler if Britain and France agreed". 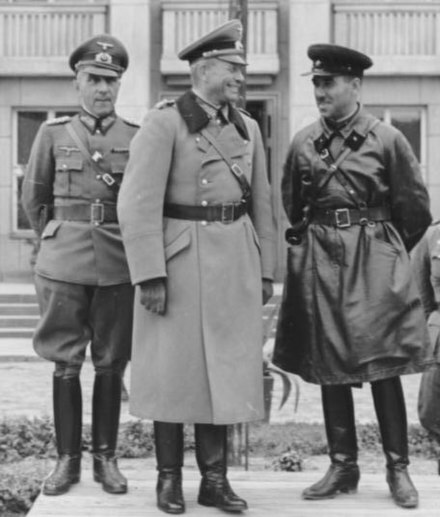 According to retired Russian foreign intelligence service Major General Lev Sotskov, Stalin was 'prepared to move more than a million Soviet troops to the German border (across sovereign Poland) to deter Hitler's aggression just before the Second World War. ↑ Salmon, Patrick (2002). Scandinavia and the Great Powers 1890–1940. Cambridge University Press. .
↑ Israėli︠, Viktor Levonovich (2003). On the Battlefields of the Cold War: A Soviet Ambassador's Confession. Penn State Press. p. 10. ISBN 0-271-02297-3. .
1 2 Herf, Jeffrey (2006). The Jewish Enemy: Nazi Propaganda During World War II and the Holocaust. Harvard University Press. pp. 97–98. ISBN 0-674-02175-4. .
↑ Osborn, Patrick R (2000). Operation Pike: Britain Versus the Soviet Union, 1939–1941. Greenwood. p. xix. ISBN 0-313-31368-7. .
↑ Moss, Walter (2005). A History of Russia: Since 1855. Anthem. p. 283. ISBN 1-84331-034-1. ↑ Gorodetsky, Gabriel (1994). Soviet Foreign Policy, 1917–1991: A Retrospective. Routledge. p. 55. ISBN 0-7146-4506-0. .
1 2 Resis 2000, p. 51. ↑ Flewers, Paul (1995). "From the Red Flag to the Union Jack: The Rise of Domestic Patriotism in the Communist Party of Great Britain". What next. Stalin was publicly making the none-too-subtle implication that some form of deal between the Soviet Union and Germany could not be ruled out. .
↑ Deutscher, Tamara (1983). "EH Carr – a Personal Memoir". New Left Review (137): 79–83. .
1 2 3 Carr 1979. ↑ Weeks, Albert L. Stalin's Other War: Soviet Grand Strategy, 1939–1941. ISBN 0-7425-2191-5. .
↑ Werth, Nicolas; Bartošek, Karel; Panné, Jean-Louis; Margolin, Jean-Louis; Paczkowski, Andrzej; Courtois, Stéphane (1999). The Black Book of Communism: Crimes, Terror, Repression (hardcover ed.). Harvard University Press. p. 5. ISBN 0-674-07608-7. , 858 pp. ↑ Parfitt, Tom (24 November 2006). "Moscow dossier embarrasses US and Britain ahead of Riga summit". The Guardian . London. Retrieved 23 August 2009. ↑ "Putin Did Not Even Think to Apologize to Poland for Molotov–Ribbentrop Pact". Pravda. RU. 2009-09-02. Retrieved 2009-10-05. ↑ Halder, Franz (1962). Generaloberst Halder. Kriegstagebuch. II. Stuttgart. pp. 31–2. .
↑ "On European conscience and totalitarianism" (resolution). European Parliament. 2 April 2009. .
1 2 "Russia scolds OSCE for equating Hitler and Stalin". Reuters. July 4, 2009. Retrieved 20 August 2009. ↑ "Resolution on Stalin riles Russia". BBC. 2009-07-03. Retrieved 20 August 2009. ↑ "A joint resolution designating "Baltic Freedom Day"". The Library of Congress. 1982-06-09. .
Carley, Michael J. (1993). "End of the 'Low, Dishonest Decade': Failure of the Anglo-Franco-Soviet Alliance in 1939". Europe-Asia Studies . 45 (2): 303–41. doi:10.1080/09668139308412091. JSTOR 152863. Carr, Edward Hallett (1949). "From Munich to Moscow—I". Soviet Studies . Taylor & Francis. 1 (1): 3–17. doi:10.1080/09668134908409726. JSTOR 148803. Shirer, William L (1990) . The Rise and Fall of the Third Reich: A History of Nazi Germany . Simon & Schuster. ISBN 0-671-72868-7. Carr, Edward Hallett (1949). "From Munich to Moscow—II". Soviet Studies . 1 (2): 93–105. doi:10.1080/09668134908409737. JSTOR 148585.